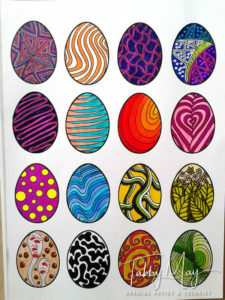 When I woke up yesterday, Easter Sunday, I was totally in the mood for decorating eggs. But with no kids around, decorating chicken eggs is kind of a weird activity to do. So I figured I had to do it differently. 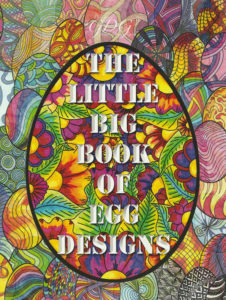 I’ve got this coloring book with nothing but eggs in it, called ‘The little big book of egg designs‘, published by Global Doodle Gems, with drawings of Maria Wedel and Johanna Ans. 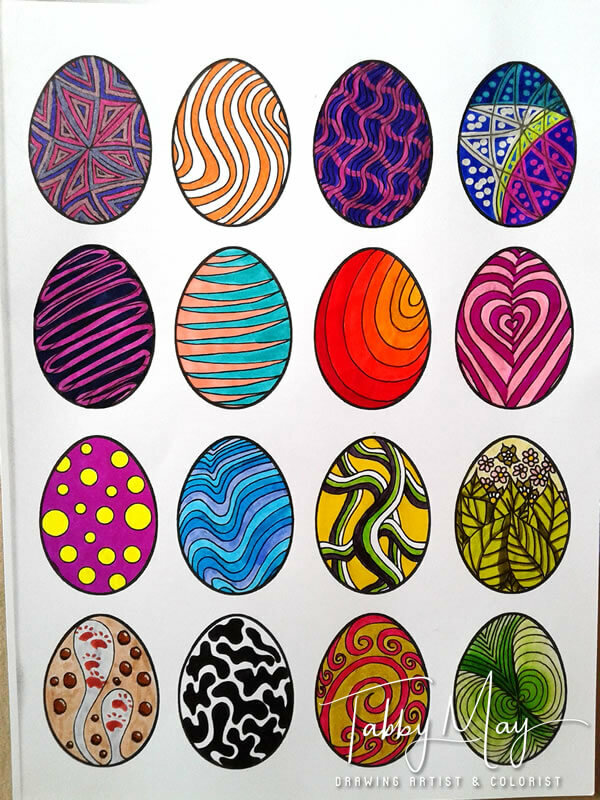 Instead of chicken eggs I used drawn egg designs. And for the Easter feeling it didn’t really matter. I randomly picked a page and put the book on the scanner to make a copy on thicker paper. I was eager to start. Unfortunately the first copy failed, since I hadn’t put the book on the scanner properly. So I turned the copy and put it back in the paper cassette, copy again and tadaaaa… success! I could start. Since I was coloring just for fun, without working on a review or something for others, I used several materials that I don’t use very often. I started with the Tombow Dual Brush pens, then came the Spectrum Noir Sparkle markers, at one point I also added using gel pens. And then I went all the the way. I’ve got a couple of children’s markers with double colors and sort of an ink eraser. When going over the color with the eraser the second color appears like magic. So there I went and used them on a couple of eggs as well. 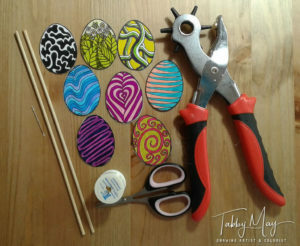 After that I’ve also used a stampable marker from supermarket Lidl and decorated an egg with some tiny feet. Finally I’ve used these stampable markers too! Before I knew it all sixteen eggs on the page were colorized. And I got the spontaneous idea to do something with them. I could cut them in and cross-slide them into each other. Nice idea, but not nice enough. The idea of eggs standing throughout the house wasn’t exactly what I was looking for. But right after that came the next idea, to make a hanging mobile. An Easter mobile. And instantly I had a clear vision on how I needed to go about. Two skewers, some invisible thread, in my mind I could already see what it would look like and started working on it immediately. At first all sixteen eggs needed to be cut out. When they were cut out I’ve made sets of two and glued them together with crafts glue, leaving me with eight remaining double-sided eggs. Then I took the hole puncher, of course on the smallest hole, and made little holes in the top of each egg. Then I tied each egg to a couple of inches of invisible thread. The latter wasn’t easy by the way, since the thread is barely thicker than a hair. Try to lay knots in a hair… But with a lot of patience I managed to get all eggs tied to their threads. When that was all done, I took two skewers and cut off the points with a pair of poultry shears. I wouldn’t cut it with an ordinairy pair of scissors. In that case I’d rather use a knife or a small hacksaw. Then I tied the skewers crosswise to each other, with a bit of glue and a lot of invisible thread. To never be separated again! All that remained now was to tie the threads with the eggs to the cross of skewers and to tie an extra length of invisible thread to be able to hang the Easter mobile itself. I’ve made loops on the ends of the threads to easily hang the eggs on the skewers. 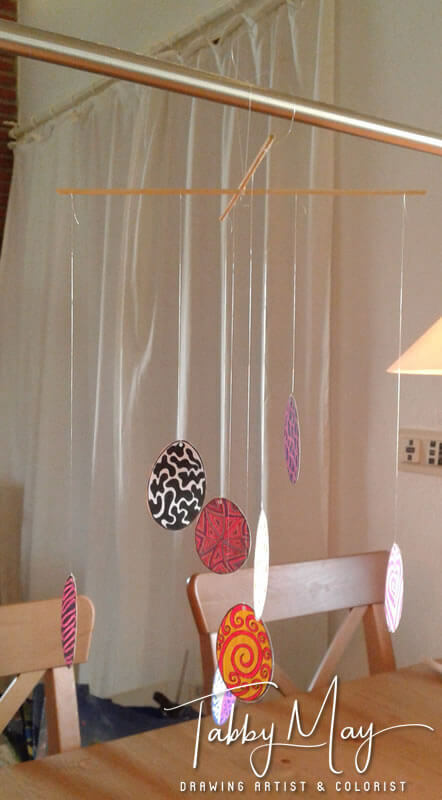 And while I held the thread in the middle, with which the Easter mobile would be hanging on our lamp, I could balance the Easter mobile by shoving the loops over the skewers to their right places. And that was that, I had finished making my Easter mobile. Would you like to start coloring such funny eggs yourself? 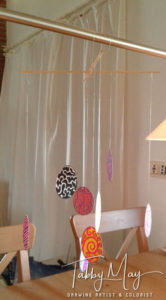 Or maybe you’d like to make your own hanging Easter mobile? 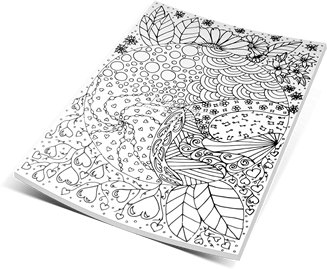 Then this coloring book comes in handy with 400 different egg designs in different sizes as well! Click here, or below on the link or the picture to order the paper edition from Amazon. Want it in digital format? Then click here to buy the book in PDF, so you won’t have to scan and can start printing immediately! Additional to this blog I’ve made a photo album as well. Watch it by clicking here. Previous: Global Doodle Gems Review Team – What am I up to? Next: Unprecedented comparison of different types of paper! Watch this and take advantage! Totally awesome… love what you did looks great !